It's been quite a tradition to participate in an annual cookie exchange/swap during the first weekend of December and this year is no exception! This weekend, I'm participating in 3 different swaps - one with girlfriends, another with fellow foodies around Chicagoland and lastly, one with fellow food bloggers around the country. Talk about a lot of cookies going 'round! Although I'm gluten free, I'm not going to let that stop me from participating. Besides, for me, cookie exchanges are all about making and sharing. I plan on sharing the gluten laden cookies I receive to those who can enjoy them! 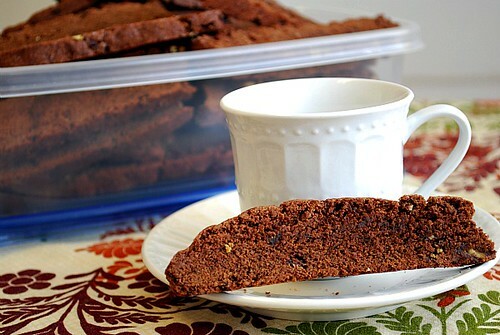 When it comes to cookie exchanges, my go-to cookie to make are biscotti. They're wonderful with coffee or tea, can keep longer than most cookies and are sturdy to withstand mailing too! I also love making them in all sorts of flavors so they're quite versatile as well. So for my cookie swaps this weekend, I prepared several types of biscotti to exchange, swap and ship to friends for the holiday. 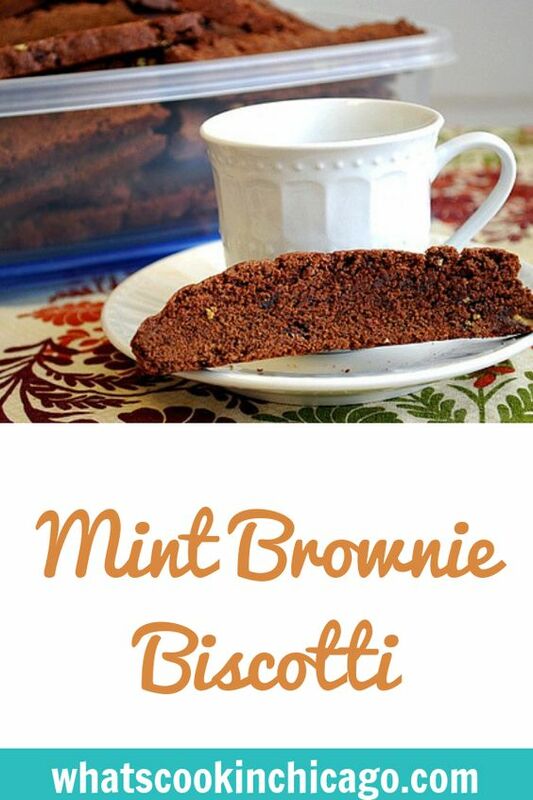 One kind I made were these Mint Brownie Biscotti. It's a delicious combination of brownie and biscotti studded with mint chips throughout... making it the perfect accompaniment with coffee, tea and hot chocolate! In a large bowl, cream together the butter and sugar until smooth. Beat in the eggs one at a time, then stir in the vanilla. Combine the flour, cocoa and baking powder; stir into the creamed mixture until well blended. Dough will be stiff, so mix in the last bit by hand. Mix in the mint chips. Shape the dough into an 9x4x1 inch loaf and place onto baking sheet. Brush with mixture of water and yolk. 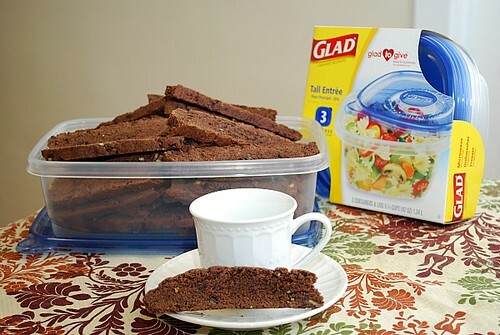 I received a holiday baking kit and stipend from Glad.. I have these bookmarked to make this year! Another option to satisfy my chocolate-mint obsession!